It’s one of the unique fruits in nature, each one low in carbs containing 15 grams of healthy fats and an abundance of nutrients. Yes, the avocado has become popular with both health-conscious individuals and those who appreciate its flavor and texture. What’s not to like! The avocado has no cholesterol or sodium and is low in saturated fats. It can be added to a variety of dishes, and it’s the primary ingredient in guacamole. No wonder more and more people are looking to have an avocado tree in their backyard. If you’re among them, read on to find out how you can grow one yourself. Using a knife, remove the pit from the avocado and rinse it thoroughly. Push four toothpicks into the pit at its widest part. Suspend the pit over a glass of water with the pointed end up. The water should cover about an inch of the seed. Place in a warm area, and maintain the water level. After 2-6 weeks, a stem and roots will sprout from the seed. When the stem is about six inches long, trim it in half. As soon as the stem leafs again, you’re ready to transplant. Prepare a pot with loose, sandy soil. Plant the seedling with the root down, leaving the top half of the pit sticking out of the soil. Give your plant frequent, light watering. Keep it in a sunny place to encourage growth. Pinch back the newest top leaves every time the stems grow another six inches. This will encourage growth and a fuller plant. If you live in an area where temperatures do not dip below 45 degrees F, you can move the plant outside permanently. Transplant it in the early spring. Start with a 3’ wide x 3’ deep hole in well-drained soil. 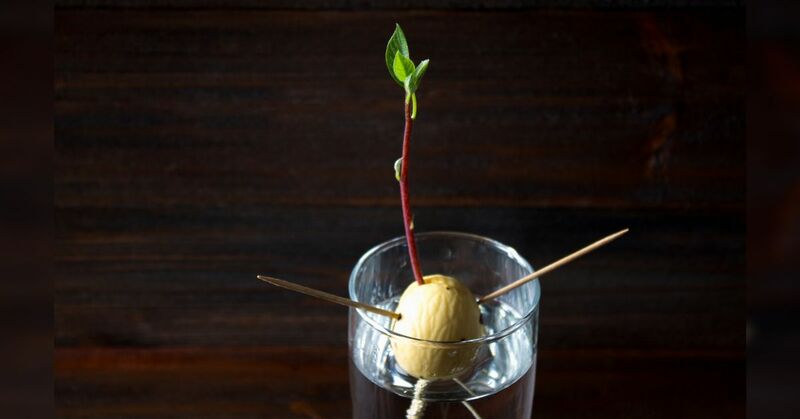 Make sure your new avocado tree gets plenty of indirect sunlight and regular watering. Then, sit back and watch it grow!